A currently-unofficial Samsung smartphone codenamed SM-J100H surfaced online earlier today. The handset is shaping up to be a Lumia 535 competitor with a quad-core processor and a 4.8-inch display. When it comes to new smartphones from Samsung, we usually focus on premium flagships such as the Galaxy Note 4, the Galaxy Note Edge, or the Galaxy Alpha. The main reason for this is that such devices represent the pinnacle of smartphone technology. However, it is worth noting that Samsung appears to be working on a multitude of more affordable smartphones, such as the sub-premium Galaxy A series, or the mid-range Galaxy E series. According to a recent leak, Samsung is currently working on a new entry-level smartphone, one designed from the ground up to compete with the Microsoft Lumia 535. 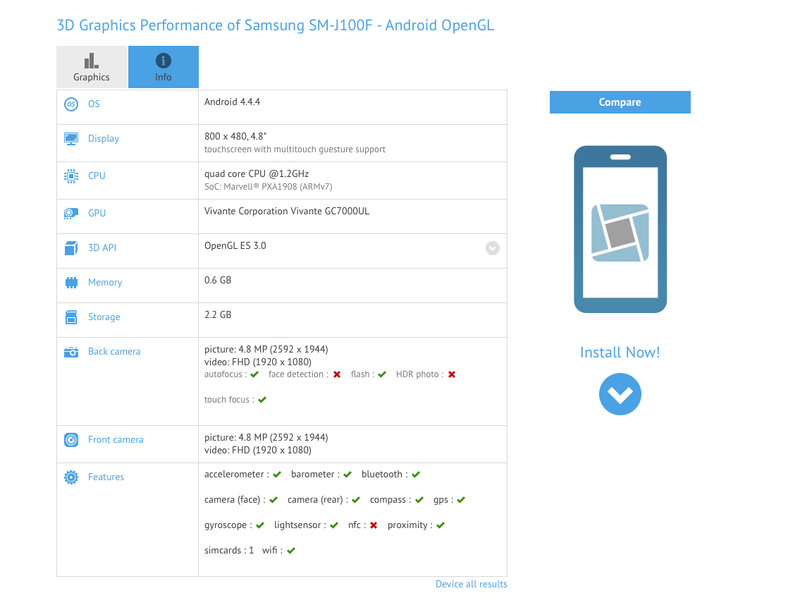 The Samsung SM-J100H was just spotted in the GFX Benchmark database, and the smartphone's User Agent Profile has surfaced on Samsung's official website. The Samsung SM-J100H is expected to come with a 4.8-inch display running a resolution of 480 by 800 pixels, while the processing power is drawn from a Marvell PXA1908 chipset paired with 1GB of RAM. The Marvell PXA1908 comes with a 1.2GHz quad-core ARM Cortex A53 processor, and a Vivante GC7000UL graphics processor. The GFX Bench website also says that the Samsung SM-J100H will come with a 5MP primary camera, a 1.2MP secondary sensor, and just 4GB of integrated storage space. Out of the 4GB, just 2.2GB will be accessible to the user, as the rest will be used by the operating system (Android 4.4 KitKat) and the pre-loaded Samsung apps. As you'd expect given the limited integrated storage, the SM-J100H will come with a microSD card slot. At the moment we don't have a release date for the Samsung SM-J100H, nor do we have any info on the pricing.